By guest writer Ian Lee. 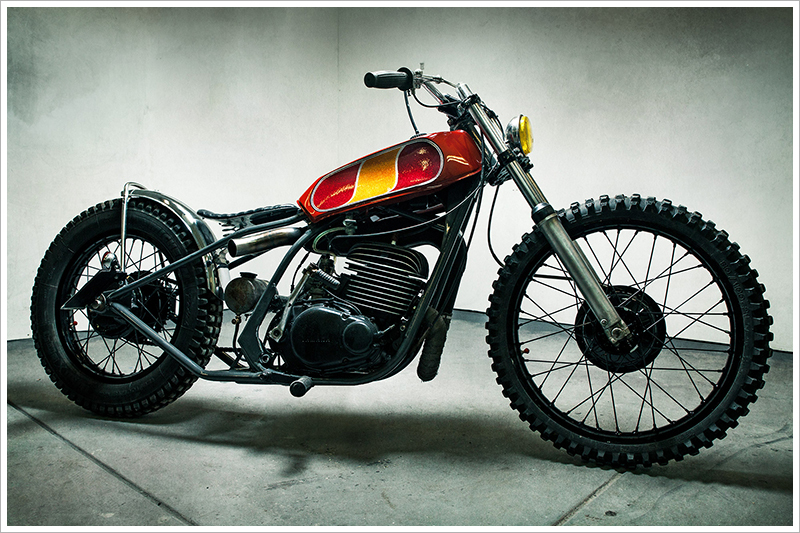 “I have an idea, let’s make it a two stroke bobber’. And that’s how the build started. From a rusted lawn ornament, the 1976 Yamaha DT400 was changed into the impressive piece of machinery you see before you today. Built over the course of three months, using original parts from the bike and anything else that fell to hand in the workshop, it was a failed attempt to enter the Rusty Kustoms Biker Build Off. Mind you, we use the term ‘failure’ in the loosest sense of the word. Built by Tom Armstrong, Matthew Blythman and Steven Blythman; a spray painter, industrial designer and civil engineer respectively. This bike is proof that you don’t need alot of money or time to build a unique custom motorcycle – a six pack of beer helps though. This beauty was found on Radical Ducati, an Italian Spanish site that has a great sense of humour and a great site that shows some detailed pics of the restoration. Judging by the pics it looks like a family affair. 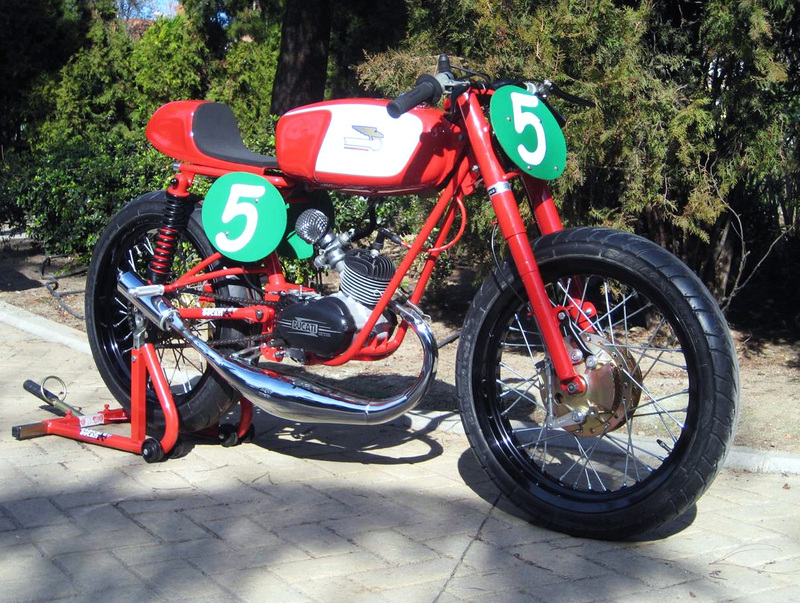 They describe this bike as a 1960 Ducati 49cc Sportivo. Can’t find much information about this model but it looks very similar to the Ducati 98cc Gran Sport. I love going to Deus. I don’t enjoy going there with my ankle biters but hey i had no choice today. They have so many great bikes in every corner. Discovered this little beauty in one of the corners today (next to the fire extinguisher and water cooler). A Yamaha R5 350cc from the seventies. Makes me want to put on my leathers and take on Mr Stoner. “350cc 2 stroke bike with disc brake upgrade. Will need very little to get up and running again. Go racing, its fun, it’ll make you a better rider, meet new friends, meet beautiful women, get rich, get bigger muscles, rub shoulders with super stars,…” I’ll take two (not that i need bigger muscles)!